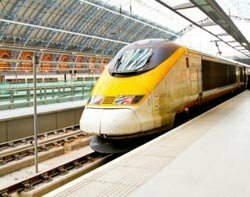 Orange today announced it would provide 2G and 3G services in the Channel Tunnel, enabling both Eurostar foot passengers and Eurotunnel drivers to use their phones under the stretch of water. The 53km stretch of rail between Calais and Folkestone in the south tunnel runs 100m below the surface of the English Channel and takes about 30 minutes to travel. Now, passengers will be able to make phone calls or surf the internet at any stage of their journey. The company claimed it was the first time a special regulatory framework had been agreed by both Ofcom and the French regulator equivalents – Arcep and ANFR – to allocate the necessary spectrum, and the deployment of the solution took just 10 months. It uses a broadcast cable running the length of the tunnel and 72 optical repeaters from Alcatel Lucent to provide the connectivity. Orange then built basestations at either end of the tunnel to complete the network. However, while French customers of Orange will be able to use the services as part of their standard tariffs, UK customers will be forced to pay roaming charges from when they enter the tunnel, despite half of the line being under UK jurisdiction. We asked Orange why it had decided to only offer deals to its French customers, but it had not responded at the time of publication. We also asked Ofcom why it had not brought up the issue before agreeing to the spectrum allocation, but the relevant spokesperson was not available. One spokesman did tell us though that the decision to make it a French exclusive was “in Orange’s hands”. Sources close to the situation told Computer Weekly other operators had shown an interest in making similar provisions for the north tunnel, which starts out at Folkestone, and deals were “in the pipeline”, which could see UK operators making similar offers to their customers. However, Ofcom would not confirm this was the case and, for now at least, Orange is the only company to have struck such a deal with both regulators and Eurotunnel itself.